The comments below were originally shared on Facebook at Opt Out CNY. Be sure to read to the end of this post to view a list of ways that school officials can support for students and effect change in Albany. This morning my husband and I had a meeting with administrators from our child’s school/district to discuss our refusal letter. There were many positive moments and the conversation was quite different than it was a year ago. This year, very clearly the ball was in our court. It was acknowledged that teacher evaluations coupled to student testing is a major problem that needs to be addressed (and quickly), and that the state of education in NYS is in shambles. Yet once again we left the meeting knowing that we would still stand on our own in our efforts to effect change in Albany. In essence, we were told, “Well, do what you need to, we sort of get it, but you’re making our jobs difficult.” I might have been able to stomach this, to laugh at it, in fact I think I smirked at my husband. But on top of feeling like my kids’ well being was a major inconvenience to them, it was implied that the opt out movement was hurting teachers. And so we sat there, two public school teachers ourselves, knowing they were waiting for us to admit we cared more about our kids than our colleagues-as if there was something shameful about that. Without hesitation, we each made it abundantly clear that not only did we not give a damn about what our refusal did to teachers’ evaluations (though we love our kids teachers and colleagues), but that it was only our courage, the actions of the amazing parents of CNY, that had a chance of making the changes that these very administrators were seeking. I remain utterly baffled that those who have the power and ability to do what’s best for kids and public schools refuse to do so. There are so so many who are still more concerned about what teachers’ evaluations look like than what the reforms are doing to the kids in our classrooms (perhaps, ahem, because their own evaluations are derived from those of teachers?!). I share this tonight because I want to remind you all that others will continue to try to pass the buck-to blame you for whatever ‘inconvenience’ the opt out movement has caused. Don’t allow it. I have a gut feeling that this year they will try to play on your emotions and your support for public schools and your child’s teachers. They will tell you that the “small sample sizes that were a result of opt out” harmed teachers and that we have to get kids to take the test so that teachers aren’t hurt. This is simply not the answer. I know you won’t fall for this-and don’t let others. We all opt out for our own reason(s) but kids are always at the heart of it. Stay true to your kids because what’s good for kids is good for teachers. We don’t have to choose. When we opt out, we are protecting our kids, we are protecting our teachers, we are stating our support for public schools across NYS. I am proud to stand with the hundreds of thousands of parents who are courageous enough to act. -Stop being afraid of pushback and start being afraid of the long terms consequences of the test and punish reforms on our children and public schools. Don’t be fooled by the false dichotomy between choosing between kids and teachers. -Meet with parents to listen to concerns. Listen only. -Provide timely and accurate information to parents and faculty while encouraging dialogue in the community and school. 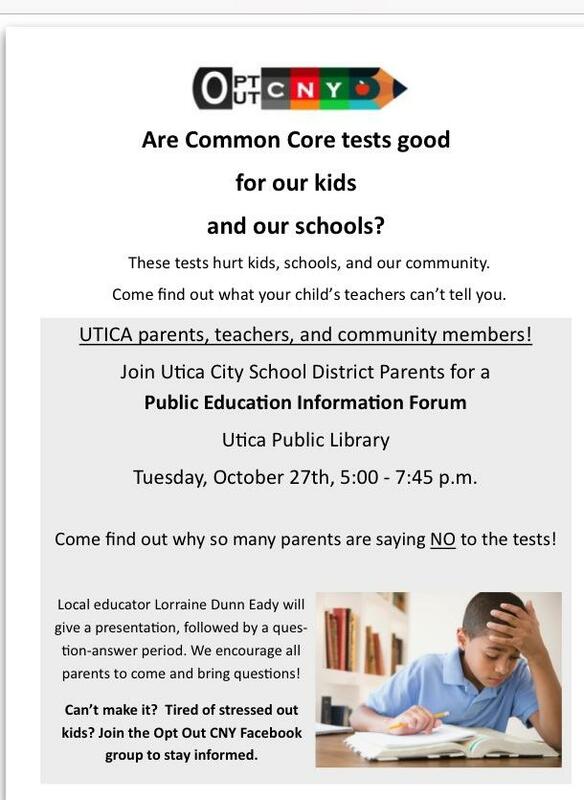 -Inform parents of their right to refuse NYS grade 3-8 tests. Why not a letter like this? -Provide an alternate location for children refusing tests. Enlist the support and help of retired faculty to supervise children who are not participating in state tests. -Host a forum for the community to outline current issues in education. Invite a diverse panel of participants, including parents and teachers, to share experiences and information. -Attend a Board of Education meeting in the district in which they work. Address the Board and share the honest truths about what classrooms look like as a result of the most recent reforms. Request advocacy from the Board. -Attend a PTA or PTO meeting to outline current issues in education and remain in contact with parents. -Meet with faculty and staff to listen to concerns. Listen only. -Write a letter to any professional organization of which he/she is a member (NYSCOSS, SAANYS, CEC, AASA) to share experiences and demand support and advocacy. -Read. Learn more about the opt out movement. Catch up on the politics behind the reforms. -Talk. After school hours, converse with family and friends. -Write: write a letter to the editor of the local paper as a concerned citizen. -Stand with parents-attend forums hosted by the community, participate in awareness events.